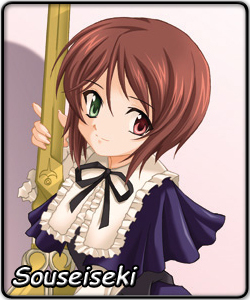 Souseiseki is the fourth of the Rozen Maiden dolls, wielding a large pair of gardening scissors for her weapon of choice. She is the younger twin of Suiseiseki, who wields the watering can, but Souseiseki is often more mature and serious. These gardening tools can be used to tend to the 'garden of the soul' of people: Rozen Dolls can enter a person or doll's dimensional/dream space ("N-field") through a suitable portal (a large mirror or puddle will do). In Doll-to-Doll combat, the scissors are a strong melee weapon and Souseiseki can use her top hat as a boomerang-like projectile if range is needed. Dressed like a boy and uses "boku" to refer to herself (usually reserved for young boys), Souseiseiki acts more like Shinku, often not joining in the fun that Suiseiseiki, Hina Ichigo, and Kamaria have. Her heterochromatic eyes are coloured the opposite way to her twin. She acts rather tomboy-ish too, except instead of being like an active outgoing boy, she acts like a reserved boy of etiquette. Loyalty defines a large part of Souseiseki's personality. She is loyal to her current masters, an elderly couple who, in delusional grief, treats her as their dead son and interferes with her maintenance. Suiseiseki ran away from that situation but Souseiseki stayed by their side. When that issue was resolved, she started visiting Jun's house where most of the other Rozen dolls lived. Yet when "Father" (Rozen, their creator) was shown to be in pain at the lack of progress in the Alice Game (the twisted quest to destroy all other Rozen dolls and become the perfect little girl Rozen was seeking to create), she threw away this happy, peaceful life to fight.